Why do you think Stan Herd calls his crop art "earthworks?" What would you call his creations? What do you think would be the hardest part about making artwork this large? Why? 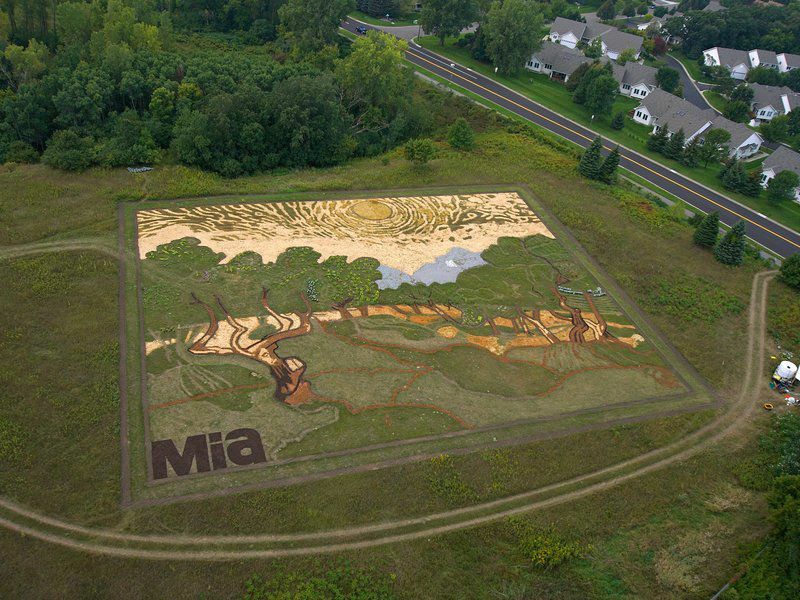 According to the article, the van Gogh crop art was commissioned to honor two milestones: The Minneapolis Institute of Art's centennial and the 125th anniversary of van Gogh's death. Why do you think people at the museum chose to advertise the events in this way? What would you have done? Herd is an artist. Why would it also be important for him to have in-depth knowledge of weather and plants? What else would he need to know to create his earthwork masterpieces? Show the video that accompanies the article. Watch it as a class. Then ask students to share what they learned about Herd's process for creating crop art masterpieces. Guide them to recognize that he begins with a copy of the artwork, which he divides into grids. He identifies the different types of materials he could use. Then he figures out the best way to transfer his vision to the plot of land, which serves as his canvas. Select a painting with a fall or harvest theme for students to recreate or invite students to select one of their own. For ideas, search through the paintings in the Smithsonian's Collections Search Center using the key words such as "harvest," "fall," "seasons" or "autumn." Have students investigate to learn more about the artist and piece of art. Instruct them to write about what they learned. Then provide students with poster board, rulers, glue and an assortment of beads, seeds, beans or other small items. If you wish, encourage them to bring additional supplies from home. Challenge students to plot and recreate the artwork. Turn the classroom into an art gallery. Have students display their artwork and post what they wrote about it. Invite the class to view and read about each recreation. Then rejoin as a class. Challenge students to share something interesting they learned about each artist or work of art. Discuss how each painting is connected to harvest or fall. Prior to conducting this activity, select several appropriate pieces of art. Divide the class into small groups. Assign each group one piece of art. Challenge students to identify the artist and record three key biographical facts about the person. Instruct them to record the name of the painting and tell when it was created. Encourage students to identify key elements of the painting and summarize how they relate to fall or harvest. Prior to conducting this activity, select several appropriate pieces of art. Divide the class into pairs. Assign each pair one piece of art. Instruct students to write a brief biography of the artist and record the name of the painting. Challenge them to conduct research to discover what may have inspired the artist to create the painting. If they aren't able to uncover this information, encourage them to briefly state where they think the painter may have gotten his or her idea. Assign each student a partner. Encourage pairs to find an appropriate painting on their own. Instruct them to write a biography of the artist and record the name of the painting and when it was created. Then have students investigate to learn more about the type of art or the time period when the painting was done. Challenge students to explain how these factors influenced the artist and the painting he or she produced. Encourage each student to find and select an appropriate painting. Instruct students to conduct research to learn more about the artist and when the painting was done. Then match each student with a partner who selected a different painting by the same artist or another painting created during the same time period. Challenge partners to compare and contrast the two works of art. This Smithsonian article shows photos from a solar-lit bike path in the Netherlands that was created to mark the 125th anniversary of the artist's death. The glowing stones along the path are meant to evoke the swirls of the painter's masterpiece "Starry Night." This Smithsonian article shows extravagant dahlia-covered parade floats that were inspired by artist Vincent van Gogh. In this lesson, students will design a "system" that shows the impact that society had on a given artist and the impact that this artist might have had on others in an artistic movement. The system might be a flow chart, a diagram or a timeline. In this lesson, students will examine various media depicting fruits and vegetables. They will use those to create their own hand-painted fruits and vegetables to hang in the Sukkah. It is a temporary shelter used during the Jewish holiday, Sukkot, that celebrates the harvest season. In these lessons, students will examine works by African American painter William H. Johnson to learn about his milieu as well as his style. The lessons are divided into grades K–2, 3–5, 6–8 and 9–12. Younger students will list the elements of the pictures, identifying colors and shapes and such objects as farm equipment, crops and animals. Older students will compare Johnson’s work with that of painter Allan Rohan Crite.